In this tutorial we will create a stereoscopic image for cross eye viewing, which means you will be able to view the final image in 3D and full color without the use of any special glasses. I will be creating a simple piece from scratch for the sake of this tutorial but the final technique learned can be applied to existing artwork very easily, granted you are the creator and have the PSD file. 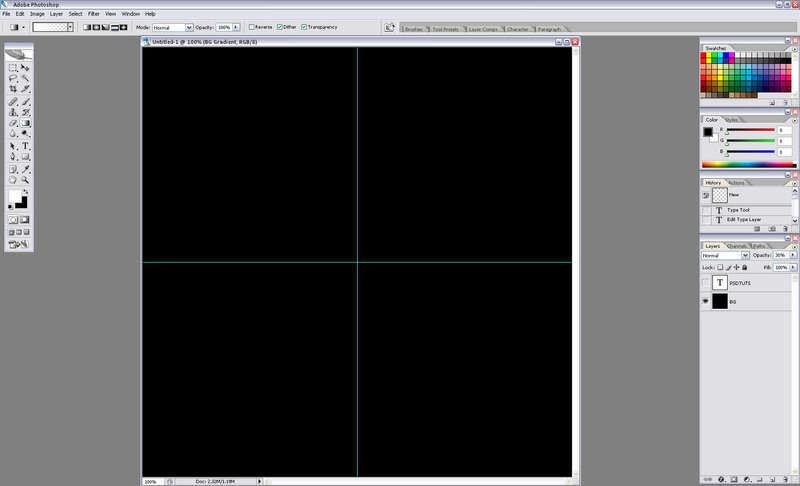 We are going to start with a 900 pixel by 900 pixel image with a black background. 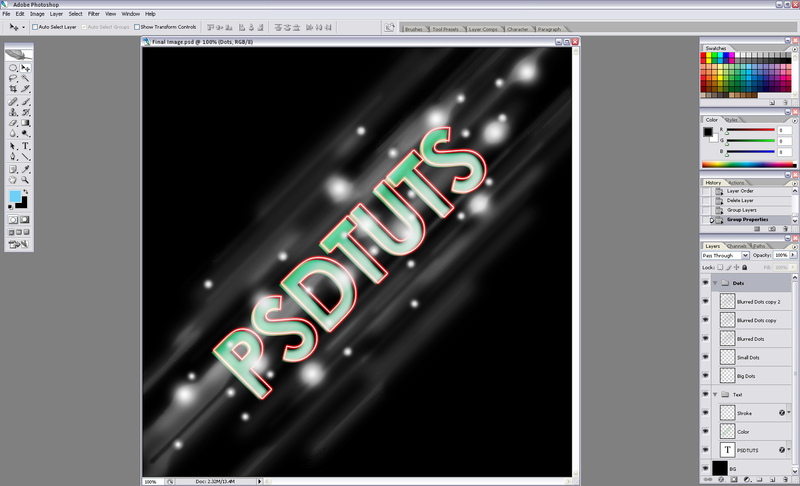 Add some white text in the center on a 45 degree angle, I went with "Psdtuts+" in Century Gothic Bold at 200 pixels tall. 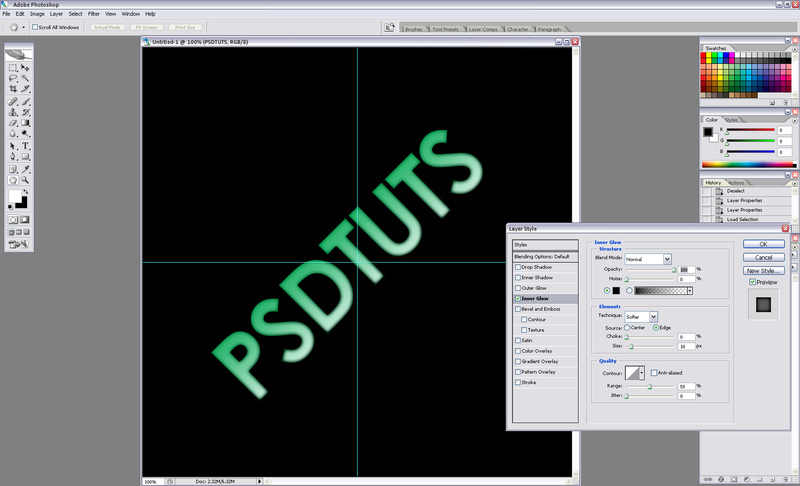 Let's add some color to the text, on a new layer I added a 45 degree gradient to a selection of the text in pure green. Let's also add a black Inner Glow using a layer style just to soften the edges. Add a 2 pixel white stroke of the text on its own layer. Move it up 5 pixels and to the right 5 pixels. Then let's add a red Outer Glow layer style to it. 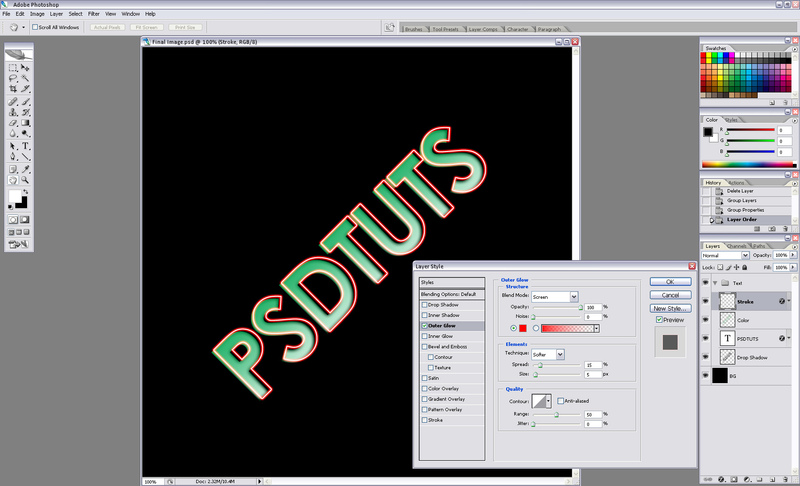 We are done with the text so let's clean up our layers a bit. Put all of the text layers in their own group and call it "text." 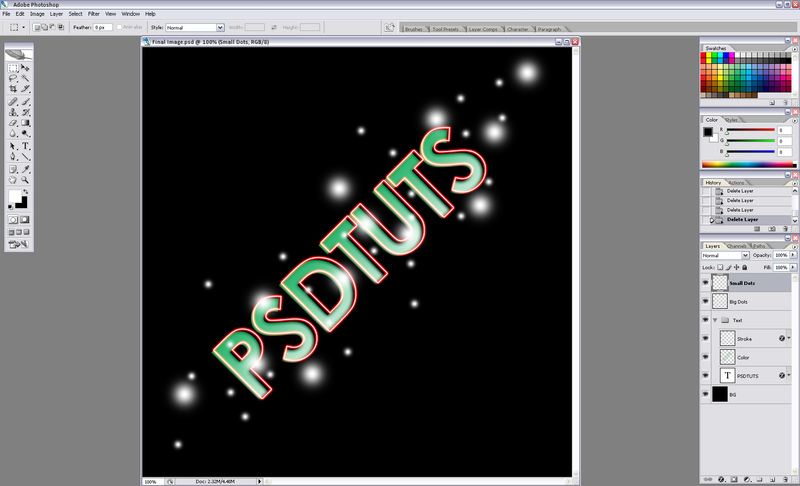 Now let's start adding some elements around the text that we can move around later that will give us our 3D effects. On a new layer use a 65 pixel soft edge brush and create some random white dots around the text with it (a single click of the mouse). Do the same thing on another layer but with a 21 pixel size brush. On another new layer, using the same 65 and 21 pixel sized brushes, draw a bunch of random dots all around the text, use both black and white colors. Then apply a 45 degree motion blur of 500 pixels. 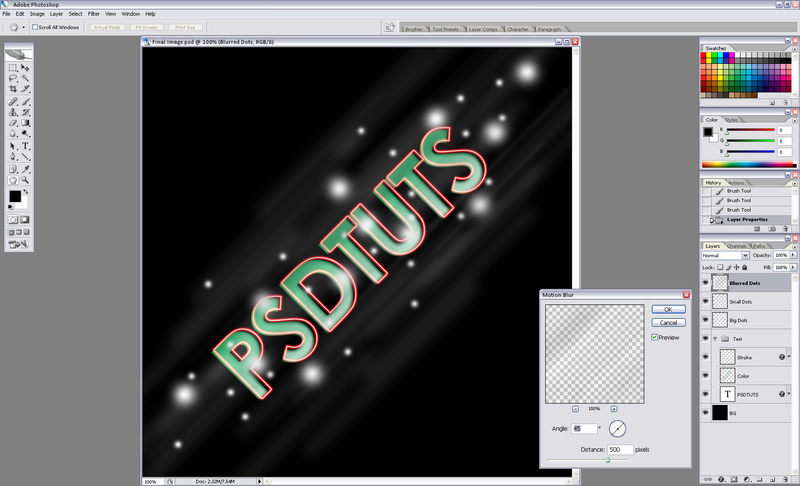 Duplicate the blurred dots layer twice and set their modes to Color Dodge. 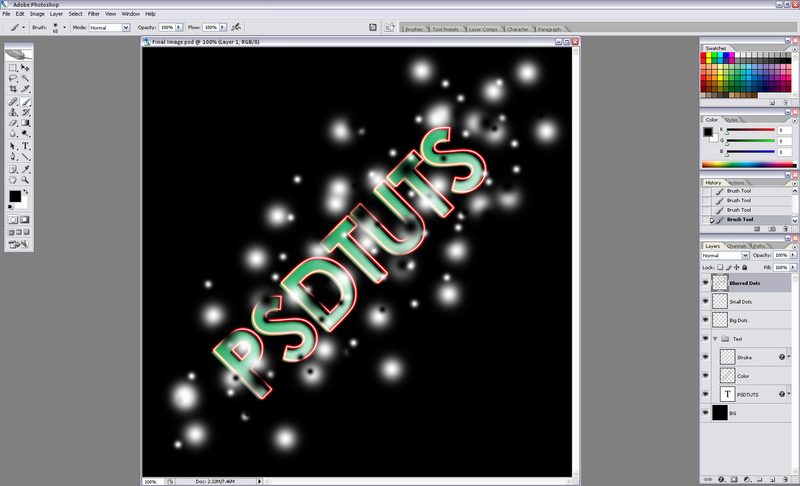 Let's continue to keep our PSD clean and put all of these layers in their own group and call it "Dots." 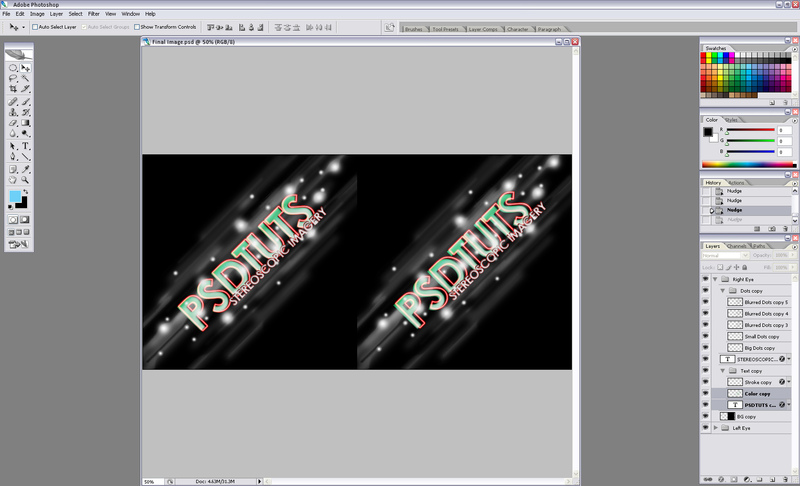 Let's add one more line of text before we start modifying the layers to create our 3D stereoscopic effect. I went with "Stereoscopic Imagery" in white and placed it slightly on top of our "Psdtuts+" text. 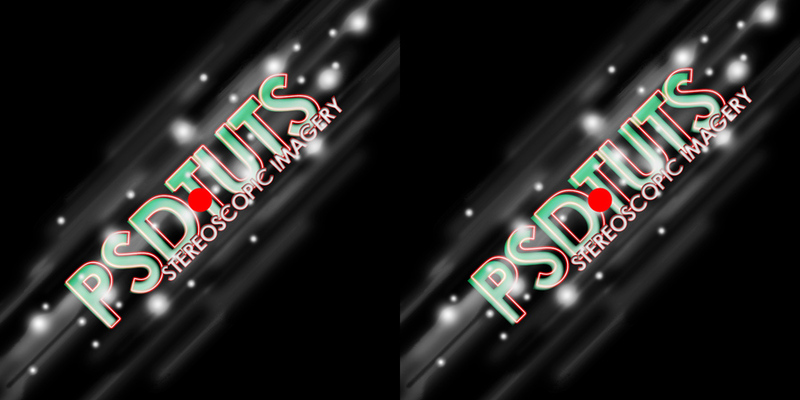 I added a Drop Shadow, black Inner Glow and 1 pixel red Stroke using layer styles. Now that we have our basic artwork created we are going to begin modifying all of these elements so that they appear 3D once we view them using the crossed eye method (more on that in the next step). To keep things organized let's put all of our layers in a group and name it "Left Eye." Increase your canvas size from the center left so that it is double the width (1800 pixels). Duplicate the "Left Eye" group and name it "Right Eye." Then move it all to the right portion of the canvas. We are going to slightly move some layers around on the canvas in the "Right Eye" group, use the arrow keys on your keyboard for this part. Select the "Small Dots Copy" layer and move it up 7 pixels, then to the right 7 pixels. Select the "Big Dots Copy" layer and move it up 10 pixels, then to the right 10 pixels. Now select the "Stereoscopic Imagery Copy" text layer and move it up 7 pixels, then to the right 7 pixels. Select the "Stroke Copy" layer and move it up 7 pixels, then to the right 7 pixels. 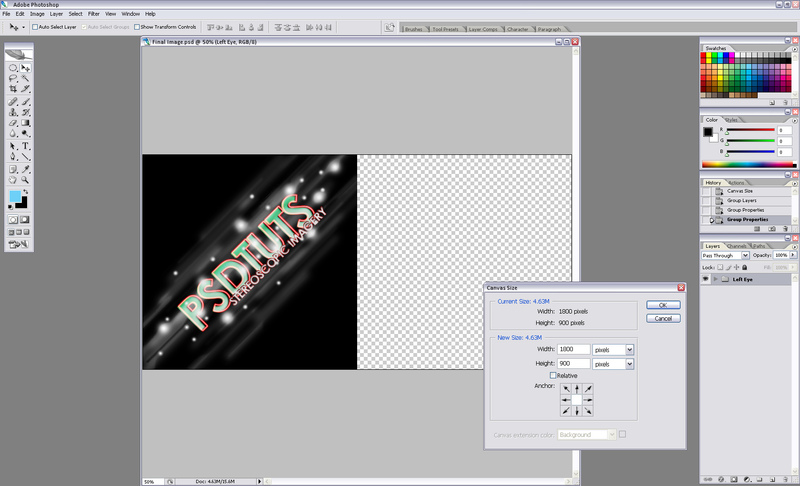 Select the "Color Copy" layer and "Psdtuts+ Copy" text layer and move them up 4 pixels, then to the right 4 pixels. Now that we have our stereoscopic image complete, it's time to view it in 3D! This might be easy for some, and tricky for others to do, but once you get the hang of it you will have no problems doing it in a matter of seconds. I have added a red circle to the center of both images to help you train your eyes on how to do this. Look at the following steps and images, then when you are ready, use the image above to try it out. Sit a comfortable distance away from your monitor and hold you index finger out in front of your monitor. Position the tip of your finger in the middle of the two images. Focus your vision on the tip of your finger and in your peripheral vision just above your finger you should be able to see the two images slightly merging. While still focusing on your index finger, move your finger closer or farther from your monitor until you see the two images merge together. Once you have them merged, slightly move your focus off of your finger and up to your monitor. The merged image should appear cleanly focused and in a nice layered 3D fashion, if it doesn't just clear your focus and try again. You can also try getting closer to your monitor. Once you get the hang of viewing the above image you can try it on the final image below without the red dot. 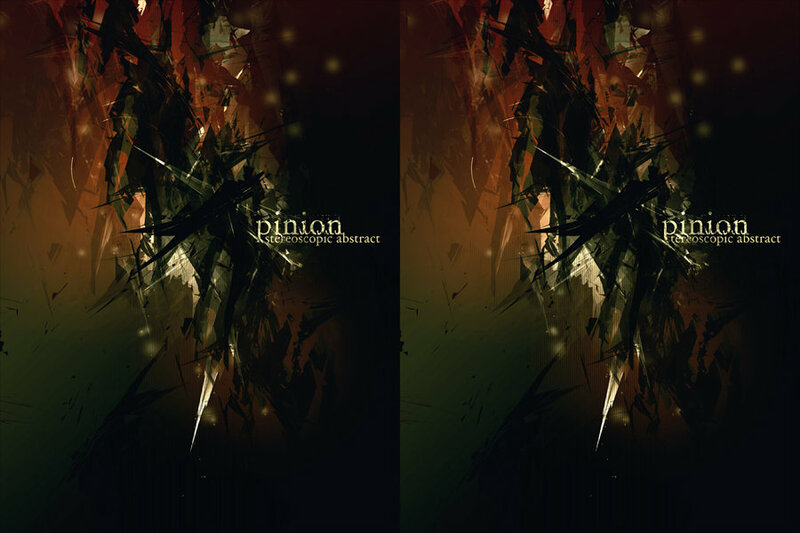 Then you can try it on my first stereoscopic image I created titled "Pinion." George Smith is a 28 year old abstract digital artist and has been creating for over 10 years. He is a member of depthCORE, runs his own t-shirt company Naature Clothing and displays his personal work and freelance projects on his site EndEffect.